by its Commandant locked away in the flight deck. headed for a new exoplanet, with no ways to send a distress call. The game doesn’t rely on graphics to tell its story, describe the environment or present challenge to the player. The day I met LAIA is a 3 months long project, made between March and June 2017 at CNAM-ENJMIN (France). We are a team of 6 people on 5 different specialities : producing, game design, programming, sound design and ux/ui design. Our goal was to make a short audio-only experience where you are able to live a story, solve puzzles and enjoy the environments. We want to experiment an unusual technology for our game: the Cardboard and the Gear VR. 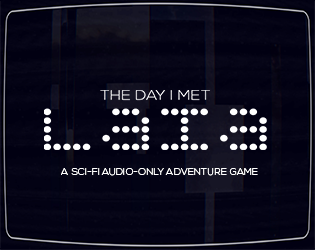 All of our sounds were made for a binaural experience, and you can listen to our trailer in 5.1. The project is presented on June 12th and 13th at CNAM-ENJMIN and on June 24th at Paris for the end of the Hits Playtime contest. This game require a wireless external controller connected via Bluetooth to be played fully. The game will be ported shortly on the 2017's Gear VR with the controller. You will also need a pair of headphones (or ear buds) correctly placed on your head, to play, or the binaural won't work as expected. Pair your wireless controller with your phone, then lauch the app, put it in your preferred viewer and lauch the game by pressing the Action button (depending on your controller). The game takes a while to load, but you will hear the commander once it's launched.